After our memorable boat paddling experience at Lake Kenyir, we returned to our chalet. It was almost 7pm and I took a shower while my friend went for a swim at the resort's infinity swimming pool. After shower, I sat for a while at the balcony enjoying the darkening skies and the view of the lake. It felt good to be alone and I silently observed the relaxing surroundings around me. Then I went back in and switched on the TV. But I was not watching it. Instead I played with my camera. 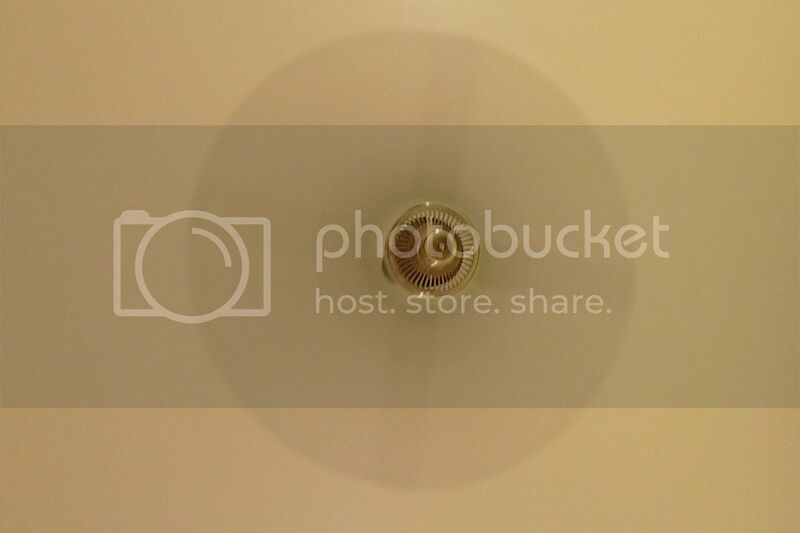 I looked up at the ceiling, saw the turning fan and took a shot of it. You must be wondering why I took photos of the fan! Well, that's what I like to do when there is nothing to do. Haha! My friend came back moments later, took his bath and off we went for dinner at Tembat Restaurant, the one and only restaurant at this resort. If you remember, we had earlier requested for a-la-carte dinner instead of the lousy buffet. It turned out that the manager agreed to our request but we were given a very limited choice of menu. Both me and my friend chose fried mee mamak. 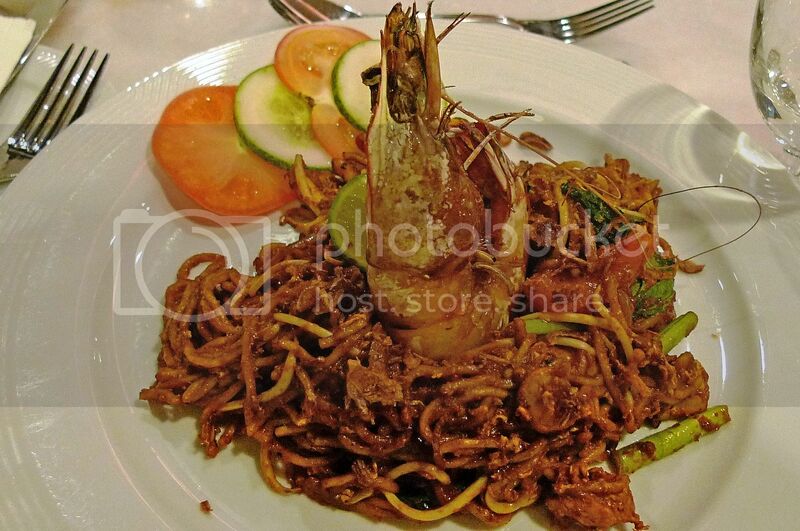 Guess how much this plate of mee with a large prawn cost me? RM12? No. RM16? Nope. And the prawn was not even fresh! I did not want to risk food poisoning, so I ate everything minus the large prawn. I can tell you if I ever return to this Kenyir Resort in future, I will definitely bring my own food! After dinner, me and my friend decided to go moon watching! What the heck is moon watching? We've done bird watching and plant watching and even bug watching, but moon watching? We took a buggy ride back to that jetty we had earlier went to for our boat paddling. It was dark. The buggy driver drove off leaving just the two of us there. You must be thinking what the heck we were doing there! 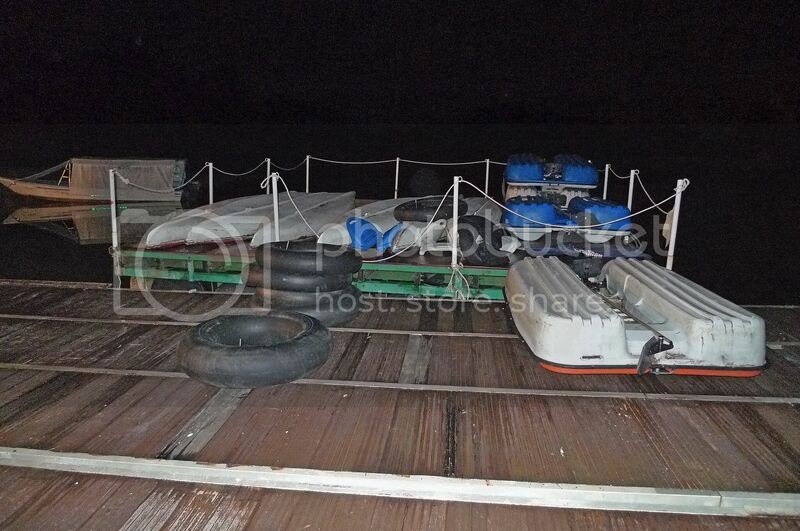 My friend and I took two rubber seats from a boat nearby and spread them on the wooden floor of the jetty. We laid down on the seats side by side looking up at the night sky. It was a full moon night! 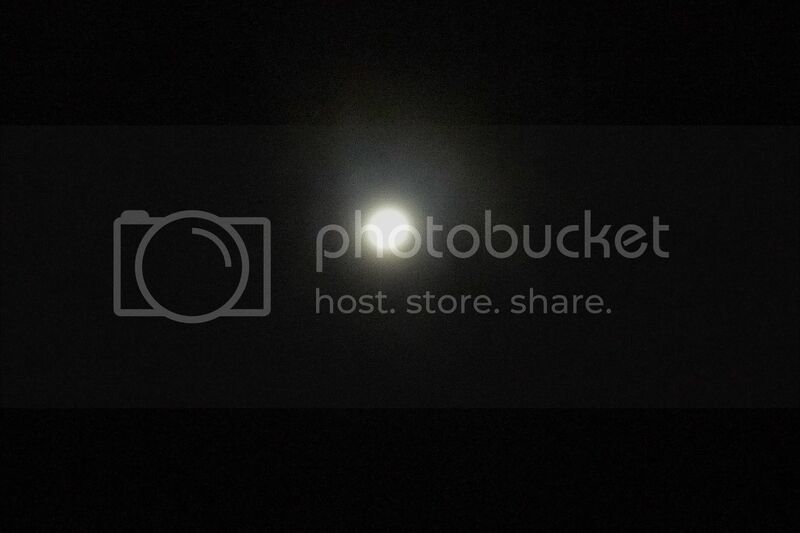 My camera could not capture the moon and its surrounding halo of light nicely. Too bad because if you were there, you would have been fascinated by that ring of bluish light circling the moon. 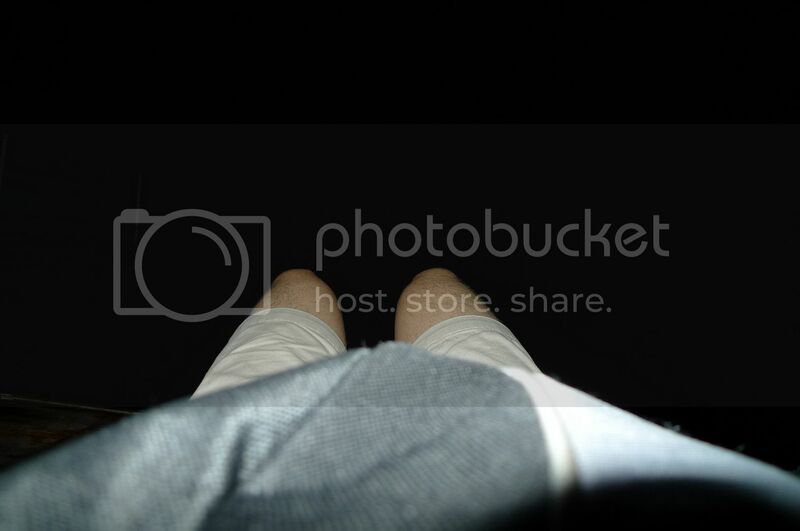 OK, more photos of my legs.....again! Haha! I was lying down while taking this shot. We could not see the lake scenery as it was completely dark. My friend and I had a good time chatting while lying there. I thought it was pretty enjoyable. To be basking in the moonlight and listening to the sound of night insects and frogs croaking. And of course a good company sure made all the difference! After we had enough of chit chatting, we made a call for the buggy service to take us back to the resort. To our surprise, the telephone at the jetty was not working! Luckily we had our handphones with us so were able to make the call. I wonder what would we do if we did not bring our handphones along! Sleep there till sunrise? Or walk back to the resort in complete darkness? 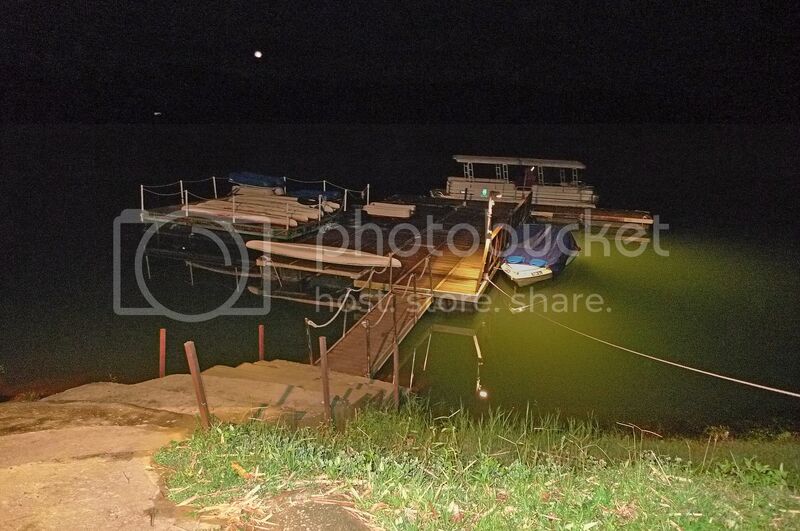 The above photo shows how Kenyir Resort front entrance looks like at night. I snapped a picture of it when we arrived at the resort. 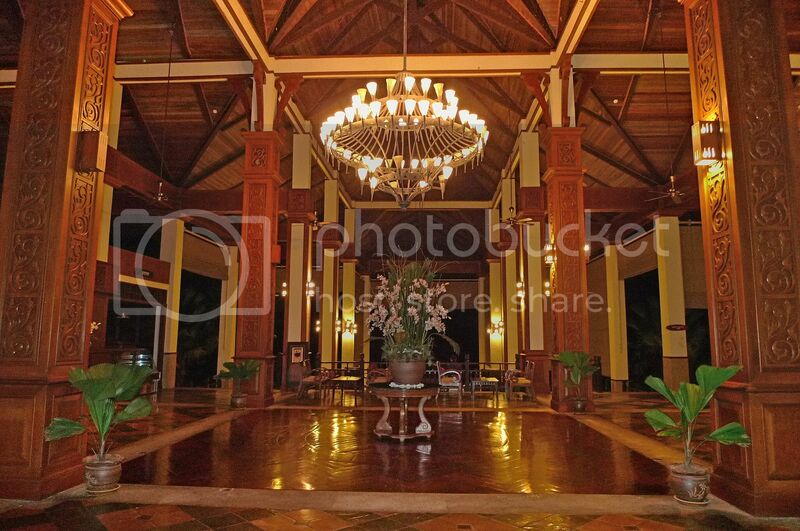 And the photo below shows the lobby area of Kenyir Resort with the giant chandelier all lighted up hanging from the ceiling. I thought it looked kind of charming. 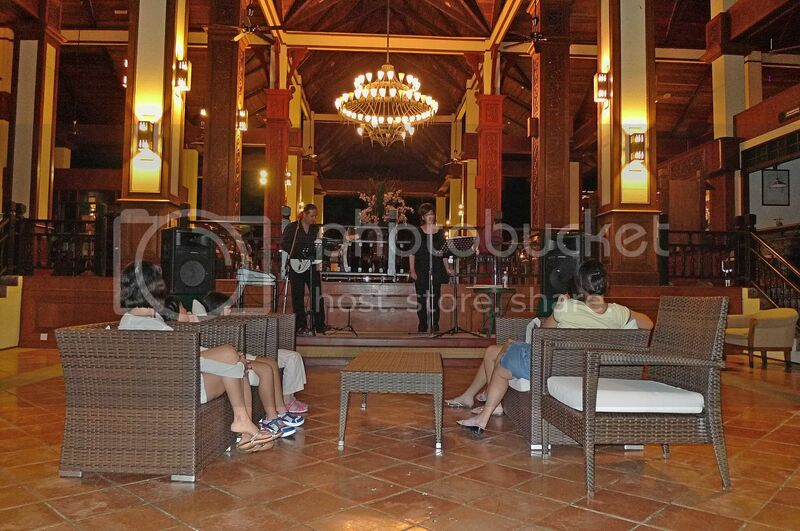 We heard someone singing at the lounge area and decided to sit there. But not before buying ourselves some snacks. OK, it's just Mister Potato and Mamee. Haha! I am not a fan of Mister Potato but when you are at a place with no good food, Mister Potato did not seem too bad! As for Mamee, I used to like eating it when I was a child, so there's nothing wrong with keeping memories of my childhood alive. LOL! We sat there enjoying our snacks and the performance. The lady's singing was not too bad. But of course, she was no Mariah Carey. Haha! 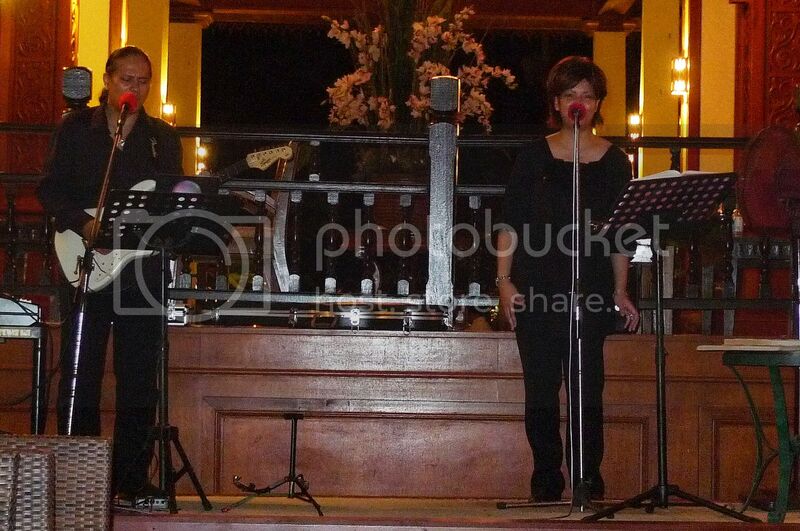 We sat there until the performance was over and everyone including the audiences had left. It was close to 1am. Although I am a night owl, my friend is not. We decided to call it a day and walked back to our chalet. It was quite dark walking along the dimly lit steps. When we reached our chalet, I took out the key and unlock the door. To my surprise, I could not turn the key inside the keyhole. What happened next would turn out to be the most bizarre and frightening experience during my stay at Lake Kenyir! Did you went to the wrong chalet Foong? That's why the key wasn't working. Should've made a scene about the lousy food. Did you lodge a complain afterwards or not? At the very least, e-mail your complain to the management to highlight the matter. RM24 for a rather small looking portion. I rather eat cup noodle lah. Wahaha!!! Spamming early in the morning. Haven't been sleeping all night coz today is a Public Holiday. W00T! RM24 of a plate of mee mamak?! That restaurant sure knows how to take advantage of tourists! Walking back in complete darkness is something I would not want to do. The RM 24 is seriously not worth it. You changed fan speed or your camera speed as two photos showed differently? lina, congrats for being FC here today! Yeah, bringing own snacks save you lots of money but I try to travel light and not bring too much stuffs. Yeah, at first I thought we went to the wrong chalet. Checked the number again and again. No it was our chalet. So you went to the wrong room? Hahaha! We complained to the staff there. Should have emailed a complaint but too lazy to do it afterwards. mei teng, yeah they sure know how to take advantage! I like Mamee too! Haha! kelvin, definitely not worth it! I would not mind too much if the food was delicious though, but it's not! cheahs@n, changed camera speed not fan speed, haha! SK,about the fan, I'm just testing my camera, haha! Oh yeah, looking up at the starry sky and full moon sure felt great! No there weren't any mosquitoes. Luckily, otherwise I would have to get one of your mosquitoes-killing rackets! LOL! I can't remember how much was that packet of Mamee but it's definitely not cheap!! No it's my chalet door cos we checked and checked. Shudder. jam, haha, I decided to mention about my paranormal activity in the next post to avoid making this post too long! Oh, you like Mamee too? Good, next time I bring some along our travel to Cambodia! LOL! You working today office in Selangor haha. 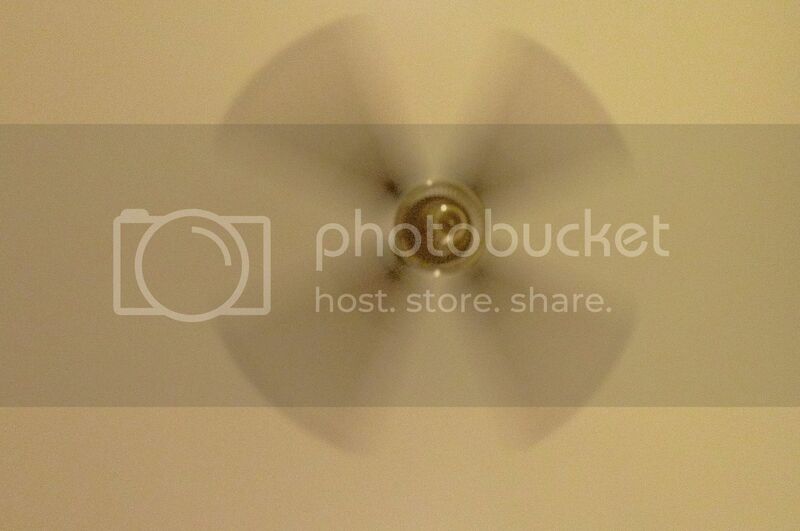 Nice experiment on the ceiling fan, you are like me itchy hands cannot sit or sleep still for a second one. Talking about the moon and pitch dark I had this first ever great experience in the cave in Gua Tempurung, Perak. When all of us were settled the guide told us to switch off our torch light to 'enjoy' the darkness. So nice. Phew it's real dark cant even see my fingers. @If you are alone then the mystery is solved your partner locked it from inside since you said he is not a nite bird, but you said 'we'..?? @If using keycard then its security reason need to update at the reception every 24 hours but you said key not card..??? @I gave up would leave it to "ghost whisperer" for answers...Woooooooooooo,ooooo...??? The 1st one is with flash the second one is without right? the mamak looks so good... RM24??? how much is it in peso??? 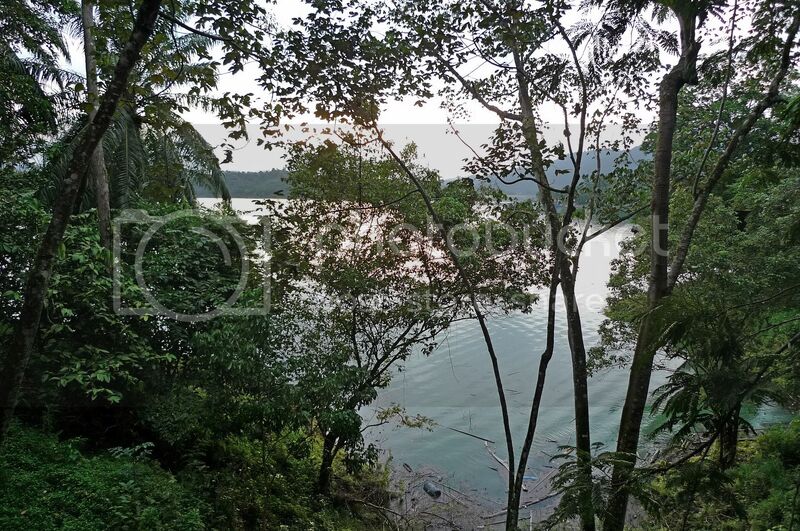 Kenyir Lake is located near enough to Kuala Terengganu that those who prefer a more urban environment can visit the lake as a day trip and return to the city at night. I'm 35 and I have mamee at home for snacks. ALways buy them each week. and RM24 for the prawn mee...? that's like 4.40 pounds.. okay la.. haha..
Haha, I once experienced someone trying to open my hotel room door, and when he failed to open it with the keys, he started to bang loudly on the door. Time to invest in a better camera since you like to take pictures of nature! since when you become advertiser for mamee and mister potatoes? What a relaxing experience chit chatting in the dark looking at the moon. Quick quick post up on the room thing. Something stuck inside the key hole? Yalor… I think bring Maggie mee better that eat this kind of lousy expensive food! What u mean by frightening experience …. You meet a ghost? woah! u and yr fren so romantic lah!!! You could not turn the key inside the keyhole because your door was NOT locked..
RM24 for a plate of noodles is expensive! Is Mr Potato the taste and shape) like "Pringles"? 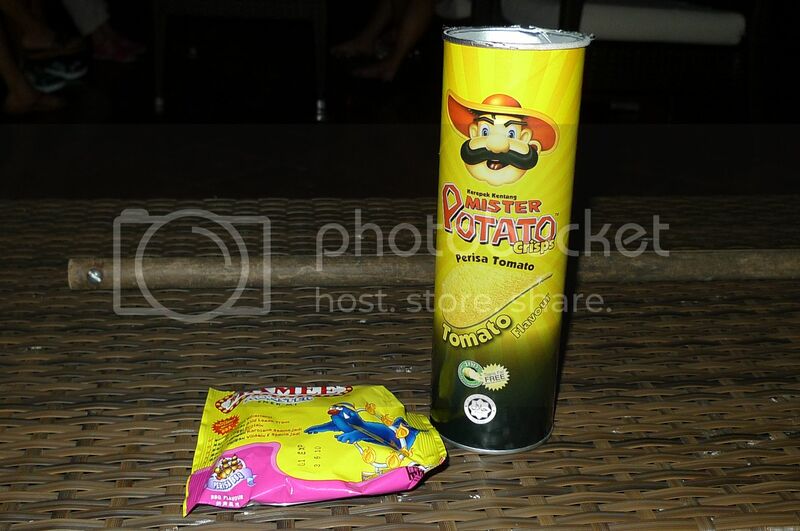 Is Mr Potato trying to mimic Pringles? Aiyoh! RM24 for that RM5 mamak mee? What to do? When in resort must pay resort prices, mah. LOL! Nice pictures of the lobby. i couldn't agree more with you. RM24 is ridiculously expensive for that kind of dish. 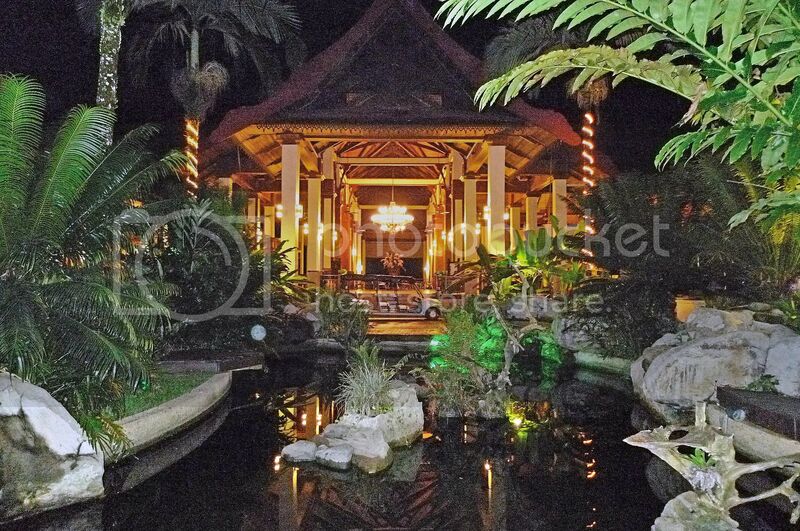 love the charming setting of the resort. it looks very inviting. Mr potato or mamee is definitely not my cup of tea. they're way too salty for my liking. bananaz, yeah no holiday for Selangor people! You got itchy hands? haha! Yeah, I like to experiment with my camera when nothing to do! Must be a nice experience in total darkness inside the cave right? Would like to experience that some time! No keycard, and no, my friend was with me outside. Where is Melinda Gordon when I need her? Haha!